FACT CHECK: Did Trump Brag He Had the 'Tallest Building in Manhattan' After the 9/11 Attacks? Donald Trump spoke of having the tallest building in downtown Manhattan after the 9/11 attacks, but whether he was "bragging" is in the eye of the beholder. Donald Trump bragged that he had tallest building in downtown Manhattan after the 9/11 attacks destroyed the World Trade Center. On 11 September 2001, as news outlets in New York, the United States, and around the world struggled to keep up with unfolding reports of that day’s terrorist attacks on the World Trade Center, newscasters from local television station WWOR spoke live on the air with Donald Trump about the event by telephone. 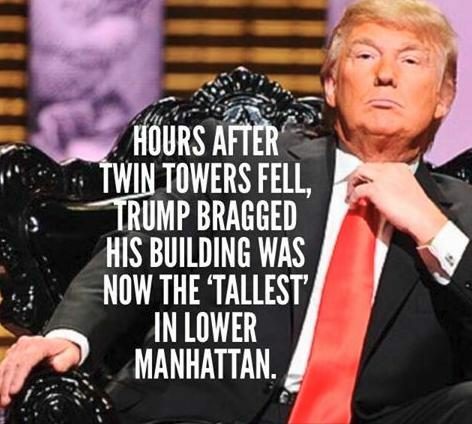 But then again, the office building at 70 Pine Street is listed as being 25 feet taller than 40 Wall Street (although it has four fewer floors), so perhaps Trump could be considered to have been “bragging” for claiming an honor that wasn’t actually his.